Psychologists have long been fascinated with the problem of whether it is heredity or, rather, environment that plays the greater role in the development of the human species. Numerous studies have focused on identical twins who were separated at birth and grew up under different circumstances. In a sense, Azerbaijanis are like that. Figuratively speaking, they've been separated from their identical twin and brought up under entirely different policies and circumstances, which, in turn, have influenced their social, political, economic and religious outlook and upbringing. These differences, in turn, have even impacted their cuisine and the traditions related to food. At the beginning of the 19th century, Azerbaijan was one territory comprised of khanates and ruled locally under the jurisdiction of the Persian Empire (known at the time as the Union of Gajar States). Conflict broke out between Czarist Russia and Persia. Two wars followed upon each other in short succession. Persia was defeated and forced to cede considerable territory to Russia in treaties signed at Gulustan (1813) and Turkmanchai (1828). and Southern Azerbaijan, which is in Iran. Left: Dinner tables in the Republic of Azerbaijan are often spread with many small dishes that are within arm's reach, as opposed to platters or bowls that are passed around which is the more common practice among Azerbaijanis living in Iran (Photo: Blair). Today, the greater population of Azerbaijanis lives in Iran: only 8 million reside in the Republic, which gained its independence from the Soviet Union in 1991. An estimated 25-30 million Azerbaijanis live in Iran. Nearly 200 years after being separated, these different "upbringings" have led the "Azerbaijani twins" down the path to different destinies and different realities-differences that we discovered were reflected even in contemporary cuisine and eating habits. Here Pirouz Khanlou suggests some of the major differences. When the Bolsheviks captured Baku in April 1920 and began establishing what would become the Soviet Union, a political course was set in Northern Azerbaijan that would forever impact every aspect of life-social, cultural, economic and religious. In fact, the changes had such a profound effect that they even impacted the traditional cuisine that had emerged over thousands of years. The Soviet Union under Lenin (1917 to 1924) began implementing a planned economic system to unify the vast territory that made up the largest country on earth, comprising 15 different countries. These policies continued under Stalin (1924-1953), who launched an intensive industrialization program that forced the collectivization of agriculture. The New Economic Planning (NEP) organized the agricultural industry systematically. Stalin set out to convert the pre-revolution indigenous feudal agricultural system into an industrialized system, mobilizing the country in a very short period to create a self-sufficient economy with full provision to feed its masses. 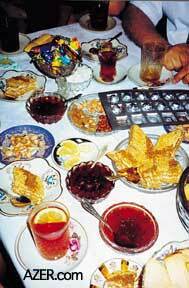 Left: Two examples of Azerbaijani dishes from Iran, shown here as prepared by Pari Abadi in 2000. Above left: Tabrizi kufta, a large meatball seasoned with herbs such as tarragon, chives and cilantro, as well as mashed yellow peas, rice and a variety of spices. The stuffing is composed of sour cherries, prunes, walnuts and almonds mixed with fried onion and a hard-boiled egg. Sometimes the kufta is so large that it has an entire chicken inside. It wasn't long before this new centralized approach impacted the traditional cuisines of the regions. Azerbaijan was no exception. Obviously, if a traditional recipe called for major ingredients that were no longer grown locally or were not accessible elsewhere in the USSR, it wasn't long before that dish totally disappeared from the table, and subsequently within a few generations even became erased from memory. In other cases, even when the ingredients were readily available, if the preparation relied upon intensive, individualized manual labor that could not be converted to mass production in factories, these foods also disappeared. Such was the case of "sangak"-a flat, wide, whole wheat sourdough bread, traditionally baked individually in earthen tandir ovens. One of the major reasons we even know about these foods today is that they are still prevalent in Southern Azerbaijan. In an effort to unify the peoples of the Soviet Union and create the generic "Soviet man", there was an overbearing tendency to impose Russian culture as a model, despite the fact that Russia was only one of the 15 republics that made up the USSR. Directives came from Moscow and always bore the mark of Russians. Crops that were grown-cabbage, wheat, potatoes-essentially catered to a Russian-based cuisine. Azerbaijani cooks had no choice but to incorporate this produce into their own recipes, to such an extent that Russian dishes like stuffed cabbage, borscht, pork sausages and "Stolichni" (a mayonnaise-based salad), though once foreign to Azerbaijanis' taste buds, soon became ordinary, everyday fare. One of the most pronounced differences between pre-Revolutionary  cuisine before in Northern Azerbaijan is the attitude towards rice and potato. Rice is not an integral part of the Russian diet; potato is. And subsequently, today in Northern Azerbaijan, potato is featured more than rice. Blame it on the choice of which vegetables should be cultivated for the demise of rice in Northern Azerbaijan today. Russians like cabbage and use it in borscht and stuffed cabbage rolls. Although cabbage can be grown under various climactic conditions, rice is much more restricted and requires a wet, subtropical climate. Soviets were intrigued with the idea of guaranteeing fresh cabbage in Moscow markets by early April, even before the snows had melted. This was possible if they planted and transported it from the southern climes of Azerbaijan. And thus the rice and tea plantations located in the Lankaran region of Azerbaijan, near the Iranian border, were replaced with cabbage farms. Tea was imported from India and exchanged for Soviet military hardware. 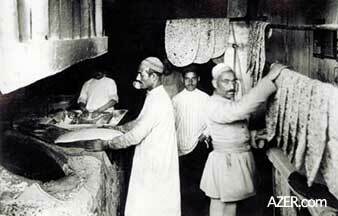 Left: Fresh sangak (whole-wheat sourdough bread) as it was prepared in pre-Revolutionary Baku, before 1920. The bread was baked on the sides of a tandir oven and then hung up to dry. Sangak is still one of the favorite types of bread in Iran, where an estimated 25-30 million Azerbaijanis live. Photos: Azerbaijan National Photo Archives. Rice, which had been so fundamental to Azerbaijani cuisine, became a rarity. A great number of traditional rice dishes disappeared. Azerbaijanis became potato and bread-eaters instead, and bread and dough-based dishes like gutab, khangal and dushbara (dishes unknown in Southern Azerbaijan cuisine) became the primary source of carbohydrates. Rice was relegated to the role of luxury-a dish served only at weddings and special occasions. 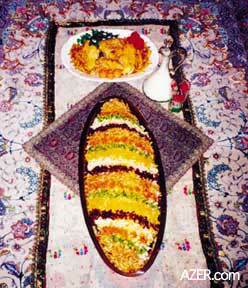 Southern Azerbaijanis, however, still enjoy rice on a daily basis, just as they have done for centuries. Left: During the Soviet period in Azerbaijan, bread was mass-produced so traditional forms like the sangak which are made by hand, soon were no longer available. 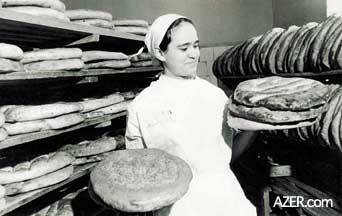 A bakery in Baku, Soviet era. Photos: Azerbaijan National Photo Archives. The Soviet government soon took control of all imported goods. 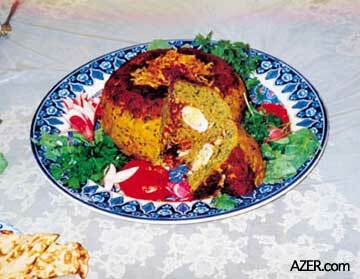 As a result, the variety of spices, which provided the nuances of flavor in Azerbaijani cuisine, disappeared. Russian cuisine doesn't require many spices, so the Soviet economic planners considered them superfluous and non-essential. Tightly guarded political borders and the state-controlled economic program prohibited spices from being imported from India or the Middle East. And so it wasn't long before the spice bazaars, with their exotic aromas and tantalizing colors, disappeared. Today, there are no spice bazaars in the Republic and the range of spices is extremely limited, especially in comparison with Southern Azerbaijan, which is known for its famous spice bazaars in the major cities of Tabriz, Urmia, Ardabil and Zanjan. The Amir Bazaar in Tabriz is especially noteworthy because so many merchants there deal in spices. Consider saffron, an exceedingly expensive spice derived from the delicate pistils of handpicked saffron stamens. Saffron provides both flavor and golden orange coloring for rice pilaf. Soviets may have considered it "bourgeois", and so it mostly disappeared. Without these spices, food in Northern Azerbaijan became much plainer. To this day, seasonings are primarily restricted to salt, pepper, turmeric and a few other seasonings. In the South, Azerbaijanis still season their dishes with a wide variety of spices, including ginger, nutmeg, cinnamon, cardamom, caraway, and numerous spices and mixtures unknown to the West. Many traditional ideas and beliefs have disappeared as well. One dealt with the categories of "hot" and "cold" foods, much like the beliefs of Ayurveda in India. These categories refer to the effect food has on the body, not to the temperature of the food itself. , yogurt, fish and rice. Foods in the "hot" category include garlic, walnuts, grapes, apples, honey, eggs, bread and red meat. Another belief system, that of traditional medicine, has almost totally disappeared in the North. Soviets tried to stamp out the use of traditional medicine based on natural herbs. There used to be herbal medicine shops called "attar", where you could treat specific ailments with dried herbal mixtures. Southern Azerbaijanis still have such shops. In Hajibeyov's musical comedy of 1913, "O Olmasin, Bu Olsun" (If Not This One, That One), the main character, Mashadi Ibad, was one such bazaar merchant who sold herbal remedies. In the 1956 movie version, scenes of pre-Revolutionary Baku include such shops (See AI 5.3, Autumn 1997; SEARCH at AZER.com). These days, now that Azerbaijan has gained its independence, people are beginning to experiment once again with treatments derived from natural herbs, but very minimally, as Azerbaijanis are more used to synthetic drugs. The introduction of alcohol, specifically vodka, during the Soviet period has shaped Northern cuisine in profound ways. For example, take the presentation of food. In the Republic, when guests arrive, they are ushered into a room with a long table covered with many small plates, all within easy reach of every person. 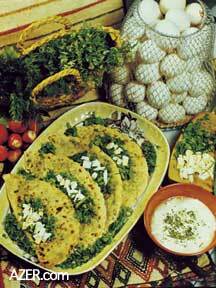 In Southern Azerbaijan, however, there tends to be only one dish or platter for each entrée, which is passed around. Why so many small dishes? Perhaps it can be traced to the influence of vodka. Traditionally, Azerbaijanis did not drink alcohol except on rare occasions. In Iran, because of religious restrictions, alcohol is illegal and few people drink. But Russians are known to be hard drinkers who consider food an accompaniment to alcohol, and not vice versa. Russians have a saying: "Tea is not like vodka, which you can drink a lot of". Russians have a tradition of serving "zakuska"-appetizers set out on small plates, such as pickles, salami, sausages, salted herring and mayonnaise-based salads. Nibbling on such dishes enables a person to sustain drinking for several hours. Today, these same food practices continue in the Republic. This may also explain why rice is served as the last entree at weddings, long after the major entrees are finished. Were rice to be introduced earlier, it could interfere with drinking because the guests would be too stuffed. Curiously, the role of vodka is evidenced in traditional expressions. When Azerbaijanis describe a difficult task, they say, "I had to eat a whole sheep to do this." The Russian version is: "I had to drink half a liter (of vodka)". Azerbaijanis in the Republic are inclined to offer a lot of toasts when drinking, a pattern that is barely known in the South. (See "Tamada", Autumn 1995, AI 4.3; SEARCH at AZER.com). Another distinct difference relates to mealtimes. In Northern Azerbaijan, there doesn't seem to be a regular schedule for families to eat-no matter which meal. But in Southern Azerbaijan, fairly routine patterns have been established, and all family members, including fathers, are usually present-even for the noon meal. Perhaps Soviet labor patterns are to blame for practices that developed in Northern Azerbaijan and are still widespread today. During the Soviet period, most women were required to work outside the home. Husbands and wives were often involved in different sectors, services or factories. Their different time schedules did not allow coordination of family mealtimes. Noon meals were often served in canteens and cafeterias in government offices and factories. In the Republic today, it is not unusual for family members to go to the kitchen and find food that has been prepared earlier and serve themselves. In the South, the majority of women still do not work outside the home and thus are able to carry out the more traditional homemaking tasks for their families, which could account for more regular scheduling. Southern Azerbaijanis still break from work during the hot midday hours. Schools are organized in shifts "before lunch" and "after lunch", enabling children to join family members, including their fathers, for the noon meal. In the Republic, no matter what time of day or night a guest arrives, it is assumed that food will be served. There is always some sort of food available. However, in the South there tends to be two categories of guests-those who are invited for a meal such as lunch or dinner, and those who drop in for tea. Plans are made several days in advance if guests are invited for meals so that a wide range of dishes can be prepared. On the other hand, having guests for tea is less formal. An assortment of sweets will accompany the tea-seasonal fruit, cakes, chocolates, hard candies or prepared sweets like the deep-fried "zulbia" and "bamya" dipped in syrup and "Iris", a chocolate flavored caramel-like candy. "Sharbat", a fruit-flavored drink, may also be offered. In Iran, two religious months based on the lunar calendar-Ramadan and Maharram-play a dramatic role in traditions related to cuisine. Ramadan (also known as "ramazan") is the strict observance of fasting in Islam. People don't eat from sunrise to sunset-in public, that is. This practice extends even to drinking water, smoking or chewing gum. However, after sundown, relatives and close family friends gather in each other's homes to break their fasts. Tables are lavishly spread with appetizers and main courses. This practice continues throughout the entire month of Ramadan and, essentially, ends up being more like a feast than a fast-every night. Maharram, the month of mourning, marks the martyrdom of the third Shiite Imam. This month is characterized by offering charity to members of the community, especially those who are in need. Wealthy people arrange large lunches and dinners either at home or in local mosques. Food is shared with the poor and indigent. Though both of these religious traditions were widely practiced by Azerbaijanis, the Soviet takeover in Northern Azerbaijan resulted in these practices becoming nearly extinct. These religious restrictions continue to impact the cuisine in South Azerbaijan. During the Soviet period, with its secular and anti-religious sentiments, such restrictions were eradicated, and Northern Azerbaijanis today generally don't observe them. For example, one of the most prized kababs in the Republic is sturgeon. Despite the fact that both Iran and Azerbaijan Republic have access to the Caspian, there are no traditional sturgeon dishes in the South. White fish is more popular. Even the practice of inviting guests over for dinner differs between the North and South. For instance, in the South, guests may be invited to sit on carpets as is the tradition, where a "sufra"-tablecloth-is spread. But in the Republic-even in remote villages-guests are always offered chairs to pull up around a table. In Iran, when the guests arrive, they are usually ushered into the living room and offered tea or "sharbat", along with sweets or fruit. The meal is not yet set out. Later on, the guests usually move to another room to enjoy the main courses. The small, cramped apartments that were built during the Soviet period don't facilitate such hospitality. Most apartments do not have a formal dining area; the small living room often doubles as dining room and may even triple as bedroom. When guests arrive, the food is already set out, with all sorts of small plates of appetizers spread on the table. All guests immediately take their places around the table, where they are likely to stay seated for the duration of the evening. Obviously, there are numerous other differences that could be elaborated. But without a doubt, the political system imposed by the Soviet system on Northern Azerbaijan has had a profound, doubtlessly irreversible, effect on the country's socio-economic, religious and cultural developments, including its traditional cuisine. Pirouz Khanlou, publisher of Azerbaijan International, is an architect based in California and an amateur gourmet cook. Marjan and Narges Abadi also contributed to the research for this article.